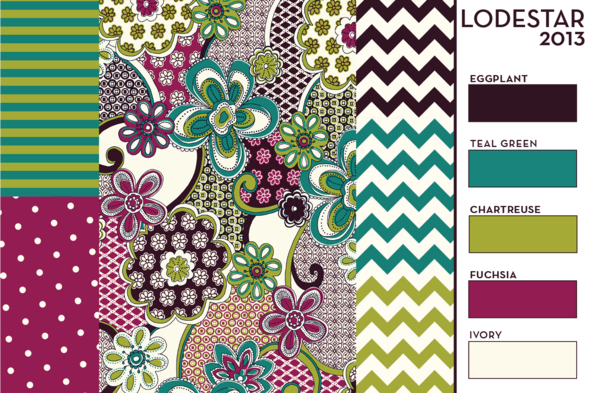 We are very excited to announce that our new exclusive line of knit fabrics from Girl Charlee called Lodestar is now available for presale purchase at girlcharlee.com. Lodestar means one that serves as an inspiration, model, or guide and we hope that this line inspires you in your sewing endeavours as much as it has inspired us! The fuchsia dot in ivory or white, and 1/2" stripe duo, are on a heavy weight 10 ounce cotton spandex fabric for those applications requiring more body and stretch. The beautiful intricate floral that makes up the centerpiece of the collection is on a 7.5 ounce cotton jersey blend in both ivory and white. There are also three of our famous Girl Charlee Chevrons included on both an ivory and white cotton jersey blend in Eggplant, Teal Green, and a beautiful Chartreuse. Each of the six designs are great on their own, but when used together they form an irresistible coordinating palette perfect for any application. We hope that the Lodestar Collection will inspire you to create something wonderful. Delivery is expected by February 1st and we can hardly wait! Fabulous!!! I love that you have coordinates here. So fun! I would love to see a darker coordinate solid like the pretty eggplant. I'm excited to follow the new blog!